Memorial Day was this past weekend, and I thought this would be a good time to give a belated thank-you to Fundtech, who last week put on one of the more memorable nights of entertainment I’ve experienced on the trade show circuit. During last week’s Insights 2014 conference in San Diego, I and about 200 other guests were treated to a gala reception at … Marine Corps Air Station Miramar? For most of us, MCAS Miramar’s main claim to fame is not as a party venue, but as the original home of the United States Navy Strike Fighter Tactics Instructor program, better known as TOPGUN. But somehow, our friends at Fundtech managed to arrange a night of food, music and dancing for conference-goers inside an aircraft hangar on the base. Make no mistake – this wasn’t just some plastic museum-tour event; it was a real active military base, and we were walking around next to real fighter jets and other planes. They’ve got everything at Miramar: helicopters, F-18A Hornet fighters, C-130 Hercules transports, and my personal favorite sighting of the night, a V-22 Osprey, the twin-rotor airplane/helicopter hybrid. 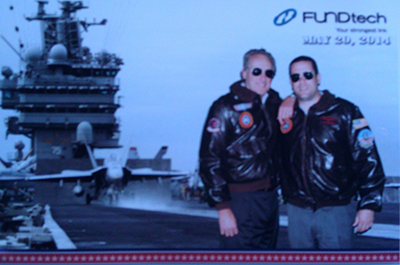 DIGITAL CHECK PRESIDENT Tom Anderson, left, and Sales Manager Fitz Anderson pose for a photo against a military scenery background at the Fundtech Insights gala at MCAS Miramar. The highlight of the night was when the Marines came down to visit the party, not just standing at attention or watching from the side, but hanging around and talking with us like regular guys. I got to meet a couple of airmen who had just flown a plane in from Arizona and made their way down to the reception – all in a day’s work. Getting to meet the Marines in “their” environment was a real thrill, and at the risk of sounding a little cliché-patriotic, it’s an honor to know that we have such a great group of people fighting for us. One question you always hear about Miramar is: “What happened to the Top Gun program?” Most people are vaguely aware that it’s no longer at Miramar, but may not know what became of it after that, or even if it’s still around at all. The answer to that bit of trivia is that Top Gun is still alive and well; it was moved to Nevada’s NAS Fallon, about 50 miles east of Reno, in 1996, at the same time the Navy vacated Miramar and transferred it to the Marine Corps. (History buffs may remember this as part of the Clinton-era military base closures and consolidations.) As for Miramar itself, the fighter jets may not be around for much longer; all fighter training is expected to move to Florida over the next two years as the F-18 is replaced by the new F-35. History and politics aside, once again I’d like to thank Fundtech for putting together such an interesting, different experience, and for giving me a memory that will last a long, long time.